The City of Bathurst, NB tendered a proposal to provide water and sanitary sewer services to the residents of the Youghall Drive area in the Fall of 2005. Total value of the work was estimated at just over $14 million including design and project management. 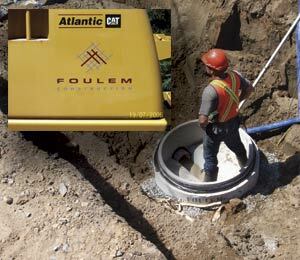 Due to their extensive experience as general and earthwork contractors, Foulem Construction was one of the few companies with the abilities to handle such a large project. Scheduling and production speed were important requirements for the supply of the 155 sanitary manholes and six sewage lift stations. Consequently, Foulem approached Strescon to provide all of the concrete structures. The order was received on January 20, 2006 and following a quick turn around on shop drawing submittals, the first structures were produced March 20. This allowed delivery to the multiple work crews to begin on May 15. With careful project management and continuous contact with the contractor, Strescon was able to leapfrog the placement crews and keep them well supplied with product. Foulem is currently ahead of schedule to complete construction by the end of 2007.